There are many cruise lines to choose from and each one has its' own unique look and feel. Ask anyone about their experience on Princess Cruises and you are likely to hear two descriptions again and again - quality and affordability. The people at Princess Cruises are masters at providing excellent service in an upscale environment at an incredibly affordable price. Our recent 5 Day Western Caribbean Cruise on the Caribbean Princess proved once again why everyone loves a Princess cruise. Our 5 Day Western Caribbean Cruise adventure began at the popular Port Everglades, in Fort Lauderdale, Florida. Home to some of the largest cruise ships in the world, Port Everglades offers a very efficient cruise terminal and boarding staff. We stepped off our shuttle, dropped off our luggage and were boarding the Caribbean Princess in under 20 minutes. Kudos to Port Everglades for such an efficient and stress-free experience. The Caribbean Princess is a beautifully decorated and well-designed vessel that can carry 3740 passengers and 1160 crew without ever feeling crowded. Princess Cruises describes her this way, "where comfortable elegance and an incredible variety of activities, dining and entertainment options await. Discover Old World charm as you stroll through our breathtaking Piazza - a hub of activity, inspired by the vibrant squares of Europe." No matter what kind of cabin you desire for your cruise, the Caribbean Princess has it with 25 Suites with private balconies, s7 Window Suites, 2 Family suites, 178 Mini-suites with private balconies, 669 Balcony cabins, 230 Ocean view cabins, and 445 Inside cabins. Feel like a swim or a soak on your Caribbean adventure? The Caribbean Princess offers 5 swimming pools and 7 whirlpool spas. In the evenings, you can even enjoy a movie under the stars from the comfort of a pool, spa or deck chair. There are a variety of cocktail and entertainment venues including the Princess Theater, Explorers Lounge, Wheelhouse Bar, Skywalkers Nightclub Club Fusion, Churchill Lounge, and Crooners Bar. Each has a unique decor, feel and entertainment style. Find one you like or sample them all. Either way, you have plenty of options on the Caribbean Princess. Other assets and opportunities for enjoyment include the Lotus Spa and Fitness Center, Casino, Wedding Chapel, Sports Deck, Kid's and Teen's Centers, Library, Internet Café, Photo/Video Gallery, Art Gallery, Duty-free Boutiques, Guest Services Desk, Shore Excursions Desk, and a Medical Center. We sampled meals throughout the ship. The Caribbean Princess served some of the best food and service we have ever enjoyed on our more than 500 days on cruise ships around the world. The dining room and buffet staff were fantastic and the Crown Grill steaks and side dishes were simply perfection. As we were heading away from Port Everglades, and then again as we returned, we made a point to awake early enough to grab a cup of coffee and be on deck to watch as we sailed past Cuba. We could clearly see the outlines of Cuba's buildings and mountains as we sailed past. The Caribbean Princess docked at the Port of Costa Maya in what tourist guides call the "sleepy fishing village of Mahahual." Though it may have once been a sleepy fishing village, it is now one of the most popular cruise ports in the Caribbean. The port offers abundant modern amenities including restaurants, bars, gift shops and swimming pools. Costa Maya, on the southern Yucatan peninsula, is a fantastic place to explore the Mayan civilization which flourished here from about 200 to 1000 B.C. Adventurous cruise passengers can choose to explore the ruins of Kohunlich, Dzibanché, and Chacchoben. We have visited both Dzibanché and Chacchoben. If you have the chance to go, these are bucket-list sites that you don't want to miss. How many people in the history of the world have had the opportunity to touch and even climb a Mayan Temple? Cozumel is a beautiful island off the eastern coast of Mexico. How beautiful is it? Billionaire Bill Gates and world-number-one, tennis star Rafael Nadal vacation here every year! The Port of Cozumel offers a variety of souvenir shopping options on-site and an abundance of tourism options around this beautiful island. 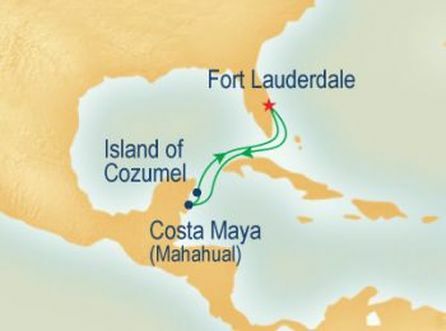 Princess Cruises describes it like this, "Mayan myth claims that Cozumel was home to the gods. Truly Cozumel is a place fit for the gods, with its dazzling white-sand beaches, ruined Mayan temples, exotic jungle wildlife, and crystalline waters teeming with tropical fish." Visitors to Cozumel can choose to snorkel, dive, swim, sightsee, dine, visit Mayan ruins, rent a jeep, dune buggy, scooter or even a Harley! We enjoyed a Custom Private Jeep Tour where we visited a private Cozumel beach club, Punta Sur Park and Beach, Celarain lighthouse and museum, Laguna de Colombia crocodile habitat, the El Caracol Mayan ruin, the La Palapa de San Martin Restaurant and Bar, and finally, the Los Tres Tonos Tequila factory where we sampled tequila! Our 5 Day Western Caribbean Cruise on the Caribbean Princess covered an astonishing 1589 miles and we enjoyed every single moment. For quality cruises at affordable prices, Princess Cruises is hard to beat.